Each week, seemingly without fail, a new Opinion piece appears in some Australian media outlet which is sceptical about aspects of mainstream climate science. Sometimes they are in the form of Editorials or Viewpoints, sometimes as Letters to the Editor. Some are written by staff journalists, some by academics or business people. But they all follow a fairly predictable pattern and share a remarkable number of commonalities. For people without the time to study the science of climate change in detail, or to keep up with the latest peer reviewed literature, these arguments against the mainstream science position can seem credible. So what to make of them? I have the solution – teach yourself to spot the recycled denialism! So, in what I imagine will be a long running series which may eventually stretch my ability to make use of Roman numerals, I’ll refute these pieces. But I won’t do it by constructing a new argument each time which, point-by-point, shows why their claims are not supported by the evidence. That would just become tiresome, given the habit most non-greenhouse theorists (‘sceptics’) have of ignoring any refuations and simply repeating themselves, again and again. No, I’ll do it by making full use of the power of what defines the Internet – hyperlinks… I’ll focus primarily on the science content of the articles, except where non-science arguments are clearly false and demand correction. First up then, is a Letter to the Editor published in The Australian on 13 August 2008, by Prof W.J. Collins. It was lavished with praise by Andrew Bolt and his devoted posters, so you can read the alternative view over there. Interestingly, while the total carbon emissions have increased steadily over the past 150 years, global temperatures have cycled between hotter and cooler on a 60-70 year scale, and even at shorter 4-5 year scales more related to El Nino events. More interesting is that carbon dioxide uptake into the atmosphere is also cyclic, associated with El Nino events. This suggests that the quantity of atmospheric carbon is mainly controlled by circulation patterns in the ocean, which is not surprising because 60 per cent of recyclable carbon is stored there. The bottom line is that humans cannot prevent global warming. Therefore, we should not be forced into emissions trading schemes, or any other scheme that sacrifices Australia’s economic advantage and standard of living for the wrong reasons. Read the hyperlinks and you’ve finished lesson I in “teach yourself to spot the recycled denialism”. EDIT: Michael Tobis has an excellent couple of blog posts which link to some wonderfully clear essays on what motivates non-greenhouse theorists (‘sceptics’) to act the way they do, here and here. I was going to wish you good luck on this potentially endless endeavor, but I bet that after you do a half dozen of these, you’ll never have to look up a new hyperlink! It’s literally the same arguments over and over again… at two completely separate discussions these past few days on Weather Underground and Watts Up, I’ve seen two different people post literally the same bunk, incorrect “arguments.” After enough of these, you’ll just be able to compile a glossary of refutations and cite each one of them for time’s sake. All well and good to issue a global debunk against “sceptics” however why don’t you actually offer your POV in relation to the points they raise? Much of what is being said in the sceptics camp makes far more sense than what the alarmists preach (yes ..you guys now have a belittleing handle too). I have yet to see any good explantion as to why the models did not predict the drop in temperature over the last 10 years? But, even better, and saves disk space is to simply reference John Cook’s Skeptical Science list [in the blogroll] and just give the numbers/codes of the standard arguments. This is especially useful in letters-to-editor or websites that have word-limits. Really nice tutorials on this can be found at Open Mind (in the Blogroll), as for example <a href=”http://tamino.wordpress.com/2007/12/16/wiggles/”Wiggles. The models are just fine. I think he meant the temperature increase began 300 years ago, not the CO2 increase: I think you knocked off the wrong bogus claim with your link. It looks to me like this one is approximately the converse of the “global warming stopped in 1998” fallacy. I see this is the second time Kimbo has posed the same “gotcha” trick and the second time an adequate answer has been supplied. Are some people just wilfully ignorant? Molnar, I think you are probably right, but I’ll let it stand as the CO2 argument by Beck is too silly an issue not to highlight, and the hyperlink proceeding that one covers the “we’ve been warming for 300 years” argument anyhow. By the way, if you find a soruce for this alleged $50 billion of climate change research, please let us all know. Sounds dodgy to me. Delta F = 5.35 X ln (C/Co). Wiki adds that “the relationship between carbon dioxide and radiative forcing is logarithmic so that increased concentrations have a progressively smaller warming effect”. But doing this sum for say Co=560 (ppm) C = 1120, F is exactly double the outcome from Co=280 and C=560. Something has to be wrong, but it is known that Wikipedia is changed almost daily on anything to do with climate change, which is why it is best avoided. ln(Ct/Co)= kT. Inserting the Mauna Loa data for CO2 concentrations in 1959 (315.59 ppm) and 2007 (384 ppm), and the increase in temperatures over those years (0.49oC, GISS), we derive k = 0.4. Then for a doubling of CO2 from the end-2007 level of 384 ppm to 768 ppm, we obtain a temperature increase of 1.86oC. Moreover, if we derive the log linear growth rate of the atmospheric concentration of CO2 since 1959, it is infinitesimally small, at 4.3276E+104 percent a year, i.e. there are 103 zeros after 0. and before the first numeric decimal. At that growth rate we will have to wait many millennia for the doubling and its associated increase in temperature to materialize. If I have errors in the above I am sure no time will be lost in telling me what they are! Further to my last, and very germane to it, I have since come across Barry’s response to Andrew Bolt (I was overseas at the time it came out). Barry: “The error Arrhenius made was in thinking that it would take 3,000 years of industrial output to cause this doubling of carbon dioxide. At current rates of carbon emissions, we look set to get there by 2050”. With all due respect Barry here falls into the Garnaut sin of using only GROSS rates of emissions. It is the atmospheric LEVEL of CO2 that counts, and that is growing so slowly that as I note above it will take millennia to double from the pre-industrial or even the 1958 level. Barry like Team Garnaut overlooks the UPTAKES of atmospheric CO2 by the global biosphere, both oceanic and terrestrial. My log linear growth rate (see above) of the growth in atmospheric CO2 at Mauna Loa since 1958 CONFIRMS Arrhenius’ view it will take thousands of years for atmos CO2 to double from 280 ppm at the current rate. Please note that climate scientists generally do not seem to be much good at computing growth rates (Canadell et al PNAS 2007 are a caee in point). Linear rates reign, but they are misleading as they ignore all years but the first and last. Log linear take into account all values and confirm Arrhenius. Tim, you seem rather confused. There is a difference between growth and growth rate. Take a very simple example. I start with $100, and am given $1 a day, every day, for 1 week. Ask anyone how many dollars I will now have? $107. But according to your logic, we would still have $100 dollars. That is because you are arguing that since the growth rate in $ handed to you has not changed (we get only $1 each day, not $1 then $2, then $3 etc). That is, ln($1/$1) = 0 – the growth rate is exactly zero. But as this toy example illustrates, demonstrating that the growth rate is unchanging is irrelevant to whether or not you conclude an accumulation is changing. So, for CO2, let’s say the growth rate is not changing (evidence says that is is). Since 1958, when Keeling started his measurements at Mauna Loa, there has been an average of 1.42 extra parts per million CO2 in the air. This is the accumulating excess. It is the observed increase in CO2, after all sinks and sources have been accounted for. It is an empirical measurement, not a model. If you take that number and multiply it by 100 years, you’ll have 1.42*100 = 142 ppm. Given that we now have 389ppm, that gives 530ppm in 100 years – almost a doubling of pre-industrial. But of course it is currently worse than that, because the rate of CO2 growth IS increasing, and on current trends will be >3ppm/yr in another 50 years. You’ll need to sharpen your maths if you want to make sure you get that paper you are writing into Nature. Barry, I can scarcely believe you wrote what you did. You may be a climate scientist but I do have some background in financial economics. Your first para. ends with a straw man. I never said anything of the sort. Just take the CDIAC/Mauna Loa data, it is most accessible at item 2, Table 2, data column 5, on my website’s home page. Work out the linear rate. IPCC states it is 0.4 percent p.a. Canadell et al (2007, loc.cit., claim 1.89% pa, but what’s 4 orders of magnitude between friends?). Let’s have your figure. Professional scientists, who rarely include climatologists, know that the correct rate is the log linear. Put the Mauna Loa into logs, regress against the years, take the exponent, then minus one and multiply by 100, and you reach my result confirming Arrhenius. Or do you when it suits you disown Arrhenius? Your second para. is equally wrong. When we come to your third para., there is really no evidence that the growth RATE is changing. The latest Mauna Loa month is in, and for July 08 on July 07 the RATE is 0.3 percent p.a. But this is partly because of La Nina, which you tipexed out of of your version of Collins. The average rate per IPCC pace Canadell is 0.4% p.a. Increases at Mauna Loa in ppm have been growing, but very slowly,and as a RATE, even slower, because the base gets bigger. Hence the need for log linear. Your flat extrapolations are simply not on, even though they do refute Team Garnaut, with its much faster doublings. I give my data, what is your source for “the rate (sic) of CO2 growth IS increasing”? The actual increase at Mauna Loa from Dec 2005 to Dec 2006 was 1.79 ppm, versus 2.55 the previous year. Check your data mate! And please show me your computations of growth RATES (%pa) at Mauna Loa before you impugn mine. Tim, if my first paragraph was a straw man then it was an accidental one – I’m honestly trying to work out what you are arguing here? CO2 is accumulating in the atmosphere. That is, the concentration of CO2 is increasing over time. There is more CO2 in the air now than in 1958, or 1988, or indeed, there is more CO2 in the air now than there was at this time last year. If CO2 was to increase by a mere 1ppm on average over the next 100 years, we would have 489ppm in 2108, taking a current value of 389ppm. If it instead increased by 2ppm (the rate over the last few years has been 2.1ppm, see the link from my comment #10), then we would have 200 extra ppm in 2108, that is, 589ppm. What is there to dispute about this? Or are you saying that you hypothesise that carbon sinks will become more effective over time, rather than less (which is what the current science says), such that at some future time, CO2 will be declining in concentration even with a continual growth in carbon emissions? That is, do you expect the Keeling curve to reverse? My feeling is that the first estimate is an underestimate since emissions over the period 1958-2008 are likely to be too low compared to the next 50 years, given the growth of China and India. The second estimate is too high because the long run growth rate of CO2 accumulation is very unlikely to be exponential for a number of real world reasons. Barry, it is late and you compete with the Olympics! Here are my first but not necessarily definitive reactions. In general, it is wrong to take either flat or exponential (linear) growth rates. Secondly, even the IPCC and Team Garnaut agree that it is logarithmic rates that matter, but they like Wiki are not much good at computing them, as it seems to me. So my point is that Uptakes have been systematically ignored or downplayed by in order Stern, IPCC, and Garnaut. My forthcoming paper on CO2 and world food production explores via regressions such Uptakes in depth, with amazing R2s (see item 2 on my website, not the final version BTW), and anticipates Collins in this regard. IPCC don’t ignore sinks. And even if they did, the fact that the Mauna Loa and other station measurements are empirical atmospheric concentrations means that all sources and sinks are accounted. The airborne fraction of total annual emissions has been fairly stable over the last 50 years at about 45% (that is, of all gases emitted in a given year, a little less than half remains airborne and the rest is soaked up by carbon sinks). Canadell et al. note a small but significant decline over time. But to cite airborne fraction from one year to another as important is quite naive, as it is highly variable on a year to year basis. But even taking a constant airborne fraction, the undisputed fact that carbon emissions have grown exponentially over the same period provides a simple reason why the rate of growth in CO2 accumulation has increased over time. The gap between emissions and the capacity of Earth systems to sink that fossil carbon continues to widen. Hence CO2 continues to accumulate in the atmosphere, at an increasing rate. If you don’t want flat rates and you don’t want exponential rates (which is what you implied by your earlier calculation), then you must want something in between. Which still leads to a CO2 doubling within the next 50-150 years depending on the future time course of emissions. Not 3000 years, which is what you had earlier said was likely. Why did you say this, if you no longer disagree with my calculations above based on 0.4% pa? IPCC states it is 0.4 percent p.a. Canadell et al (2007, loc.cit., claim 1.89% pa, but what’s 4 orders of magnitude between friends? You don’t need to look further than this to realize that Curtin doesn’t know WTF he’s talking about. Here in the US, at least, 1.89 is not 10^4 times larger than 0.4. Barry: 1. You said: “But even taking a constant airborne fraction, the undisputed fact that carbon emissions have grown exponentially over the same period provides a simple reason why the rate of growth in CO2 accumulation has increased over time”. But has it? IPCC as I note below said it was 0.7% pa in 1991 and now admit it has been 0.4% pa since 1958. Not true: see my graph of the actual airborne fraction in items 1 and 2 on my home page. 3. “Hence CO2 continues to accumulate in the atmosphere, at an increasing rate”. Not true: the rate fluctuates, as low as 0.2% in April, and 0.3% in July this year, higher in May and June, average according to IPCC is 0.4% pa.
4. “If you don’t want flat rates and you don’t want exponential rates (which is what you implied by your earlier calculation), then you must want something in between”. It’s not what I want but what fits the data. Log growth rates shown in my graphs do. 5. “Which still leads to a CO2 doubling within the next 50-150 years depending on the future time course of emissions.” Even linear extrapolation of the atmos level of 384 ppm at end 2007 at the IPCC rate of 0.4% pa (which was the actual from 1958 to 2004) only produces a doubling to 768 ppm by 2182. Garnaut’s 1500 ppm by 2150 is a gross deception designed to spread alarm and justify his ETS. 6. Barry again: “Not 3000 years, which is what you had earlier said was likely. Why did you say this, if you no longer disagree with my calculations above based on 0.4% pa?” I or rather my Excel disagrees. BTW, again, IPCC was using 0.7% pa in 1991, and now admits it has fallen to 0.4% pa. The 3000 years results from computing the log linear growth rate from 280 in 1750 to 384 in 2007 (or from 1958 if you prefer), by regressing the logs of each year’s ppm against the years. The resulting rates if exrapolated take us into never never land. Look, please just do it on Excel or whatever. That is the nature of logarithmic growth rates. IPCC admits the logarithmic nature of the system, but hates the outcomes, so suppresses them. It seems Arrhenius was right (if correctly quoted by you). I could be wrong, but I’d like to see the Excel spreadsheet proving it. Tim, it shouldn’t be my job to teach you junior High School maths, so this is my last attempt at an explanation to you (I won’t be extending my lesson further on this point). You don’t need a spreadsheet to demonstrate that you are wrong. You cannot use an exponential model to derive a parameter estimate, CO2 growth rate (Cr), and then use a linear model to make a projection. This is your error. Now, if you wish to make a projection with this figure, you must use the same model you used to derive the estimate, i.e. You have used step 1 to fit the growth parameter and step 2 to make the projection. Put as simply as possible, you can’t mix and match your models and parameters to suit your purpose, which is what you are doing. So enough of this nonsense, go and write your Nature rebuttal. My calculations agree with yours at your (1). But I was referring to doubling from the 2007 level, not from the pre-industrial. Your ref. to Canadell is incorrect, as they clearly state their claimed growth rate of 1.89% is for 1959 to 2006, but I am glad to see you do not accept extrapolations using their rate. Re India and China, despite their rapid emissions growth, the growth at Mauna Loa has hardly changed, and is in fact on average lower since August 2007 than it was in the previous year. Thus ‘my point’ that you ask for is that Uptakes are too often ignored as in your comment and as in all computations in the Garnaut report so far, which is how they achieve their 700 ppm (not your 561) by 2100 and 1500 ppm next century (fig.5.4). BTW, the end-December values at Mauna Loa were 383.9 straight, or 384.6 seasonally adjusted. Where do you find 389? I don’t see how these statements of yours, claiming surety of a doubling over a period of not less than thousands of years, are compatible with my calculation in 1 showing a doubling of CO2 from 280 to 560 by 2100 with no further growth in current emissions. Or are you admitting you were totally wrong? Or do you disown yourself when it suits you? Barry, you are right, and thanks for nagging at me, I had inadvertently regressed years against CO2, which had the effect of wrongly confirming your Arrhenius. I sincerely apologise for aspersions above. But, when are you going to get Canadell et al to correct their claims (1) that the airborne fraction of CO2 emissions is always more than 55% (you know and have stated above that on average it has been only c45% since 1959, as I have also repeatedly shown), and (2) that the growth rate of atmospheric CO2 since 1959 has been only, as we agree, 0.4% p.a., not the 1.89% that they claim in their peer reviewed PNAS 2007 paper. Why are their errors sacrosanct when mine are not? (3) Why do you think Garnaut’s Draft Report should be allowed both to cite Canadell without correction, and to project atmospheric CO2 on the assumption throughout its chapters 4 and 5 that the airborne fraction of CO2 emissions is and will be 100% from now to eternity. (4). Why when as you agree more than half of emissions have been and still are taken up by the biosphere, do you insist on your blog that emissions have to be reduced by much more than half? (i.e. to less than 4.5 GtC)? (5) What will be the effect, if you are successful in your ambitions, on world agricultural production of reducing CO2 uptakes through photosynthesis below the current net 5 GtC p.a. reported even by Canadell et al? Tim, in short Canadell are looking at growth rate over the last few years, not over the last 50. CO2 growth has accelerated – it was low in the the 50s, higher in the 60s, 70s, 80, 90s and exploded in the naughties due to the absolutely unprecedented growth of Chinese emissions – about 11% pa from that rather large country which now constitutes over 25% of global emissions. Garnaut goes through all this in detail, I suggest you actually read the draft report. Re: 4 because oceanic and terrestrial sinks are demonstrably declining (albeit slowly at present) and emissions are rising dramatically, such that to hope that the 45% of the last 50 years will be the same in the next 50 is staggeringly optimistic. Q5 doesn’t make any sense – ag emerged and flourished in a pre-industrial CO2 level. Barry, with respect you are wrong on all 3 of your points. First, Canadell et al clearly state that their “1.89% pa” or “proportional trend, %y*^-1” refers to the “atmospheric sink”, not to fossil fuel emissions over the same period 1959-2006, which they state to have been 2.17% pa. Your first para. refers only to emissions. The same is true of Garnaut ad lib ad nauseam. I thought climate science considers the atmospheric concentration of CO2 to be what causes warming, not emissions per se. So what matters is the NET emissions, which determines the airborne fraction. Canadell’s claimed rise in the AF is not evident in the CDIAC data, which yields a best fit flat trend. whereas their reported data in their Table 1 actually show even for 2000-2006 54% “distribution of annual emissions to land and oceans”, for an AF of 46%. (Actually using their data source the AF was 45%). Given the rapid growth of emissions, that the Airborne Fraction (not absolute, which as we agree is growing at only 0.4% pa) is growing barely perceptibly if at all, provides no grounds for your pessimism. It remains true that very little attention is paid to the actual resilience of the biosphere in taking up ever more CO2, with demonstrable beneficial effects on world food production. Ironically in light of your final comment, Maddison and all other economic historians date the beginning of the agricultural revolution from AFTER 1750, the starting point for “pre-inbdustrial CO2” which fortuitously no doubt is when James Cook – and many others – was bringing coal from Newcastle to London!! There is in fact no evidence for sustained growth in agric before 1750, see also Clark, reviewed by Gittins in the SMH last Saturday. So my Q5 stands, there is a very close correlation between growth of atmos CO2 and growth of food production that actually far outweighs new varieties, population, fertiliser use, and warming temperature as causal factors (see my forthcoming paper). Cutting atmos CO2 back by more than 50% could well have the same adverse effect on world food prices as the rush to biofuels did, foreseen by none, but now confirmed by the World Bank. Another unintended consequence I fear of ill founded science politics. Tim, you have repeatedly proven that you do not know what you are talking about and continue to be flat out wrong. Indeed, your track record here shows that you will insistently harp on about a point, demanding that you are correct, even when given the real answer. It is only when one makes the dedicated effort of explaining your error in excruciating detail that you are willing to back down. The above case about different model projections of CO2 proves the point well enough. Frankly, it would take me too long to continue to do this, on every point, when there are plenty of other more interesting comments to read and respond to here. As such, I am not going to bother to continue this tennis match with you. I suggest that if you are sincere about understanding this topic, that you do a bit of reading and educate yourself properly on this matter, including learning some basic mathematics (if you choose to pose math-based arguments) so that you cease to demonstrate zero knowledge of fundamental equations. Oh, and go ahead and write that Nature rebuttal you’ve promised us. Barry, I admire your patience. Ain’t it grand that the intertubes have such a memory?! The last was particularly entertaining, if laborious, but all demonstrate Tim Curtin’s incapacity with basic physics, mathematics and biology. It was about this time that I stopped being as polite with Denialists as I had been initially, and also about the time that I gave up on frequent explanatory posts that were wasted on education-impermeable brains. posted 19 August 2008 at 11:58 PM by Bernard J.
Bugger. I am doing something wrong here. Another attempt at the first two of the three links I tried above. The third one is accessible under all the text! posted 20 August 2008 at 12:05 AM by Bernard J.
Whimper. I did it succesfully a few days ago! posted 20 August 2008 at 12:07 AM by Bernard J.
Gack! What am I doing wrong?! posted 20 August 2008 at 12:09 AM by Bernard J.
Bernard, if you past a straight hyperlink in here it will be auto-linked by WordPress, provided you put the hypertext transfer protocol specification first, e.g. Barry, feel free to tidy these last few posts as you see fit. And if someone can tell me why my html tags are suddenly failing me, I’d be much obliged. posted 20 August 2008 at 12:16 AM by Bernard J. Which should make life easier, everytime a “skeptic” recycles long-discarded arguments from 10-20 years ago, assuming they want to know, just refer them to this website. Andrew: Thanks. Who exactly are the Real Scientists at the Blog you link to? John Cook seems not to know that the Arctic sea ice has not disappeared this year as he expected. But even if it had, there is abundant evidence from the Russians, Canadians, and Norwegians that this happened in the 1920s. So what is new? More seriously, Barry and yourself appear to think that it is enough to believe in global warming to be exempt from normal checks and balances, and for the rest of us to be consigned to Hansen’s oblivion. For example, here is a quote from the Abstract of Canadell et al (2007) that I challenged over at Deltoid last November: “The third process is indicated by increasing evidence (P 0.89) for a long-term (50-year) increase in the airborne fraction (AF) of CO2 emissions, implying a decline in the efficiency of CO2 sinks on land and oceans in absorbing anthropogenic emissions. Since 2000, the contributions of these three factors to the increase in the atmospheric CO2 growth rate have been 65 16% from increasing global economic activity, 17 6% from the increasing carbon intensity of the global economy, and 18 15% from the increase in AF.” My critic “Luminous Beauty” (sic) said: “It is not nice to call people liars if one does not understand what they are saying. Given that a quick reading of Canadell et al. is sufficient to verify that their paper actually makes a claim completely at odds to what you say they admit to, however, gives one ample evidence to conclude that not only are you [i.e. me] a liar, but a very stupid one at that”. Now was that scientific discourse in the sense presumably meant by you when you said above “However, in my impression some of these people do not even wish to accept the SCIENTIFIC METHOD …”? 1. A regression with a P of 0.89 has no validity. 2. Their own Table 1 shows unequivocally that the Airborne Fraction of Fossil Fuel + LUC emissions of CO2 averaged only 43% from 1959 to 2006, and 45% from 2000-2006, where the final year was an El Nino, their Table extended to 2007 would show virtual equivalence with the long term average. 3. Their partitioning is manifestly incorrect: Even the Garnaut Report admits that the global carbon intensity of GDP continues to decline (Fig. 4.3). 4. The Canadell claim in their Abstract that 18% of the increase in the AF is due to increase in the airborne fraction (AF) of CO2 emissions, says that my ingrown toenail is 18% due to my ingrown toenail. Brilliant! In any case the AF is a ratio between variables, and not a variable. 5. However Barry Brook has indicated above he does not consider it worth pursuing Canadell & co for claiming in their Table 1 that the rate of growth of atmospheric CO2 from 1959 to 2006 is 1.89% pa, even though he and and I and the IPCC agree that it has been only 0.4 percent pa since 1959. Next time I enter Calvary Hospital here and my temperature is recorded as 4 times the actual reading I shall not be surprised to wake up dead in the deep freeze. Andrew, surely you would agree that climate scientists should not be exempt from normal due diligence? Yet my experience here and at Deltoid is that any effort in that direction leads to one being called a stupid liar. But even if it had, there is abundant evidence from the Russians, Canadians, and Norwegians that this happened in the 1920s. So what is new? Update: a detailed response has been provided by A Glikson – see link at the top of the post. Like you, I wish GW did not exist, or would go away. No total melting of the Arctic, as is occurring at present, has taken place since the last interglacial – 124 thousand years ago. Those who are termed “skeptics”, rather then look at the major trend, are looking for errors, such as always exist in any field of science. They selectively pick segments of the data – for example recently they claim global cooling for the last 8 years, even if mean temepratures have been rising since 2003 – albeit at a lower rate than before the 1998 thermal peak, due to the decline in the 11 years sunspot cycle. Those who follow the comprehensive literature, or even text books, for example Barrie Pittock’s book “Turning Up the Heat”, and reports by the CSIRO, BOM, Hadley, NASA, Potsdam etc. institutes, will have difficulty in denying GW and its anthropogenic origins. On the other hand, in so far as any “skeptic” has any credible new evidence, or can interpret the existing evidence in terms other than GHG-forced climate change, they should formulate it in the form of scientific paper/s submitted to the peer reviewed journals. This should prove a major contribution to science and humanity. Unless, of course, the claim there is a “global conspiracy” on the part of thousands of scientists, science organizations, the IPCC and most governments, to “manufacture” a global warming theory. Gah, the first link to the Glikson rebuttal was broken – sorry. Fixed now. The RMIT graph as of August 2008 shows a loss of less than 1 million sq. km. so far this year against the 1979-2000 mean. Maps at NSIDC indicate an expansion of 30% since August 2007 (hat tip to Marohasy and Goddard). Perhaps there will be “total” disappearance in due course, but when? The area of ice in the Greenland Sea in April–August of 1921–1939 was 15–20% less than in 1898–1920 (data of Karelin). In the Barents Sea the area of ice was 12% less in 1920–1933 than in 1898–1920 (data of Zubov). Vise pointed out that since 1929 the south part of the Kara Sea in September was free of ice, while in 1869– 1928 the possibility of meeting ice there in September was about 30%. The polar ice very often came close to the coast of Iceland in the last century and in the beginning of this century. During 1915–1940 the situation changed: no ice was observed in that region; negligible amounts of polar ice were noticed there only in 1929. The thickness of ice determined during the Fram cruise was 655 cm; during the Sedov cruise it decreased to 220 cm (the reason for this was more intensive summer melting of ice). Before Arctic warming, the strait of Jugorsky Shar froze near the 24th of November, but in 1920–1937 it became frozen two months later—in January. According to Vise, near Dicson and Franz-Joseph Land the amplitudes of tides increased by 20–30% as a result of a decreasing amount of ice. * an increase in the velocity of winds, connected with common intensification of atmospheric and hydrospheric circulation. The velocity of the drift of North Pole station in 1937 was 2.4 times greater than the velocity of Fram’s drift. Vise noticed that cyclones’ paths changed. They moved significantly northward from their paths before the Arctic warming and so the wind regime changed: After 1920 the prevailing winds in Jugorsky Shar changed from cold east winds to warm southwest winds. According to Vise, in Varde (northeast of Norway) since 1918 the average annual air temperatures were higher than the average air temperature of the previous century (the exception was 1926, when the average temperature was lower by 0.2°C). Beginning with 1930, not one negative anomaly of average yearly or monthly temperature was observed in the whole Arctic sector from Greenland to Cape Tcheluskin, and during the same time the positive anomalies reached significant values: 1934/35 ± (4–10)°C, November in Spitsbergen ± 10°C. Vise noticed, that the average annual temperatures observed during the Fram cruise (for the period of November 1893–August 1895) were lower by 4.1°C than those observed during the Sedov cruise (for the period of November 1937–August 1939), although the Fram and Sedov locations more or less coincided (Fram, 81°59’/113°26′; Sedov, 82°43’/121°30). At the station Tikhaya (Franz-Joseph Land), temperatures below 40°C were never observed after 1929. But 10 expeditions in the archipelago before 1929 observed such temperatures every winter, except 1896. Knipovich, in 1921, was the first who paid attention to the changes of Arctic fauna. Marketable species of fish spread to the north after the beginning of the 20th century and fisheries in the north became more intensive. Some benthos species spread to the north. The ornitofauna of the Arctic region changed: some species of birds (White Gulls) left their places of habitation, and some southern species were noticed in the far north (swans in Iceland). Uspensky stated that 40–50 species of birds moved to the North during 1890–1930. * possibility for non-icebreaking ships to double Novaya Zemlya every year since 1930. * In 1912, the ship Foka, a member of the Sedov expedition, could not reach Franz-Joseph Land. * In 1912, the ship St. Anna, a member of the Brusilov expedition, was trapped in ice near Yamal and carried out with the ice to the central Arctic. * In 1901, the icebreaker Ermak failed to double Novaya Zemlya. The waters of Nordcape Current (Zubov) became warmer by approximately 0.7°C in 1940–45 compared to the beginning of this century. In the regions adjacent to Spitsbergen and Franz-Joseph Land, the lower boundary of the cold intermediate layer rose from 150–200 m in the beginning of the century to 75–100 m in 1940–45. Not one station made during the Fram cruise showed Atlantic Waters exceeding a temperature of 1.13°C, but in 1935 (Sadko cruise) Zubov observed Atlantic Water temperatures reaching 2.68°C, and in 1938 (Sedov cruise) even in the places situated to the north and east of Fram’s drift (it must be colder there) the temperatures reached 1.8°C. According to Shokalsky, “the temperature of surface waters of the Gulfstream steadily rises from the beginning of our century.” The increase of surface waters’ temperature can also be seen (Shokalsky) in the other regions of the ocean subjected to the influence of the Gulfstream and the Atlantic Current. As for credible critiques of AGW, what of Spencer and Lindzen? The latter’s latest (available via Marohasy) with its analysis of hot spots inter alia seems to have occasioned some alarm among true believers! More generally, arguments should surely be assessed on their own merits rather than on appeals to the authority of peer reviewers, who often have their own agenda. The reason I bang on about Canadell et al is that they sought and have achieved political impact with their questionable claims – used by Ross Garnaut to underpin his assumption of zero biospheric Uptakes of CO2 – that the oceanic and terrestrial sinks are already “saturated”, so that all future CO2 emissions from fossil fuel burning and LUC will add pari passu to the Atmospheric concentration of CO2. Yet their actual data (Table 1) for 2000-2006 shows that Uptakes amounted to no less than 5 GtC or 55% of the average CO2 emissions of 9.1 GtC pa over that period. Absent more evidence of decline than they offer, the Rudd-Garnaut plans for cuts of 50% from 2000 implies a reduction of emissions to about 4.55 GtC, below the Uptake amount. What will that do to the partial pressure of Atmos. CO2? What will that do to oceanic release of CO2? What then will be the net climate effect of the Wong Pollution Reduction Plan? 1. When spring and summer melting takes place, it progresses from the Siebrian shores northward, therefore reports by Russian mariners earlier in the 19th century reflect melting in the proximity of to some distance from the shore, not the total Arctic Sea ice melt. 2. Prior to the onset of satellite observations, no reliable estimates of the degree/extent of Arctic Sea ice melt were possible, only more local and circumstantial evidence. Andrew: Thanks. Let’s see how this year turns out. I would hedge my bets about the fabled opening of the NW Passage by next week. Re the GISS data, I would be more cautious than you in accepting it at face value. They have already had to back off saying “12 of the hottest years” have globally been since 1994 or so, as that does not apply to the USA. John Goetz (over at http://www.climateaudit.org today) has just confirmed what I have previously noted that GISS is really dubious in regard to Africa, where there were hardly any stations in the tropics from 1880 to 1946, helping to create more “global” coolth for that period. What does “global” mean when the station spatial coverage is so poor and getting worse by the year? The GISS global grids are hardly statistically representative. And their use of the cool 1950-1980 period as mean is sleight of hand. A fairer base would be 1960-1990 (15 cooler, 15 warmer years). Your link re Lindzen is a two edged sword. Will you resign from ANU if it has ever received any funding from Exxon? Is the Garnaut report to be rubbished because he has done work for Woodside and heads up mining companies? I hope so! “Integrity” is a word that used to be associated with academe, your link implies otherwise. Let’s just have a reasoned response to Lindzen, whatever his links. What, you mean they’ve had to retract something they didn’t even say in the first place? By the way, exactly when was it that NASA announced this humiliating backdown? Hmm? I seem to have missed it. You expend so much effort tying yourself in knots you should chance your name to The Human Pretzel. On one hand you claim global warming peaked in the 1930s, based on data restricted to the land mass of the contiguous USA (ie exluding Alsaksa and Hawaii), then complain that the GISS coverage was inadequate during that same period because it didn’t cover Africa as thoroughly as you would have preferred! I don’t suppose you’re aware of the irony? Gaz: I have made it a rule not to converse with non-persons. When and if you say who you are if you are, then I am prepared to discuss. Cheers. As you know – I wish you were correct and GW is not taking place, or at least Homo sapiens was not responsible for it. 1. Nit-picking weaknesses in a scientific discipline or theory does not amount to a contradiction of essential observations. A classic example is the creationists’ “the God in the gaps” strategy, namely they discover a gap or missing link in the fossil record, questioning Darwinian evolution — some time later the fossils are found and the link closed, so they find another missing link etc. etc. 2. The correct method is to attempt an explanation of the vast and fast growing body of evidence in terms of analternative theory. Quite apart from a Nobel Prize, this would result in a huge sigh of relief, including my own. 3. If and when a medical doctor, or a group of doctors, diagnose a dangerous epidemic, or a life-threatening illness, how much time and effort should one spend in attempting to look at real or imaginary faults in the diagnosis? 4. Risk assessment: People issue insurance to the value of $thousands each year, and nations spend $billions (the $US trillions)on defence based on risk assessments. Climate change is a risk established by the World’s major science institutions (Hadley, NASA, Potsdam, CSIRO, BOM) based on the work of thousands of scientists, with consequences which would defy imagination in terms of desertification, sea level rises, storminess, loss of lives. 5. If all these scientists are incorrect, the damage in the error would pale into insignificance compared to the damage caused if the denialists are wrong. Do the denialists consider this factor? 5. Is there any stage, in terms of temepature rise, ice melt rates, sea level rise, slowing-down of the Gulf stream, or storm intensity, where the denialists would concede GW is actually taking place? Maps at NSIDC indicate an expansion of 30% since August 2007 (hat tip to Marohasy and Goddard). It was actually maps at UIUC, which Goddard used to “prove” that the NSIDC graph of ice melt was off, and that rather than being 10% above the 2008 minimum on August 11, it was really 30% above last year’s minimum. Goddard attempted to do this by counting pixels on a map projection, ignoring the fact that map projections have geometric distortions due to the mapping of a spherical section onto a two-dimensional surface, and the fact that the map image had been JPEG’d. Goddard is still defending his pixel-counting without taking into account geometrical distortions, however, he was forced to issue a retraction a couple days ago that appears on the Register and Watts’ web sites. melting nearly as fast as last year, and this is indeed troubling. And, Tim, the claim wasn’t “recovered 30% since last August”, it was 30% over the 2007 minimum. It was really 10% on August 11, and today it’s down to about 5%, and well, The NSIDC graph is getting more interesting. The NSIDC graph which Goddard now agrees is accurate. You said: “As you know – I wish you were correct and GW is not taking place, or at least Homo sapiens [is] not responsible for it.” Let me help you fulfil your wishes! 1. The evidence for GW is dubious at best, see Marohosay in yesterday’s The Australian (Weekend edition). The problem is that the GISS/Hadley etc land-based measurements are all contaminated, mainly by incomplete coverage (notably Africa 1850-1946, resulting in enhanced cool temperatures and Siberia 1990-2008, resulting in enhanced warmer temperatures). Jen. Marohasy’s satellite data are relatively pure and certainly have better global coverage unaffected by whether or not Zimbabwean (or Somali, Sudanese, Congolese, Siberian etc. etc.) meteorologists showed up for data logging on any given day. 2. Given (1), with its minimal real evidence for secular, i.e. more than 30 years trend (as opposed to cyclical, less than 30), the Homo Sapiens effect really is debatable. We have had continuous atmos. CO2 growth since 1945, albeit only meticulously measured since 1958 at Mauna Loa, so why the cooler period from 1945 to 1975? Coming now to your first numbered point, “Nit-picking weaknesses in a scientific discipline or theory does not amount to a contradiction of essential observations…” your response is really only arm-waving. Citing the satellite temperature record since 1979 is not “nit-picking” – or are they not “essential observations”? Your second numbered point: “The correct method is to attempt an explanation of the vast and fast growing body of evidence in terms of an alternative theory. Quite apart from a Nobel Prize, this would result in a huge sigh of relief, including my own.” Not so fast. The Popperian rule is that if the observations do not match the original hypothesis, it is the latter which has to be withdrawn, and it is for its progenitors (e.g. you) to produce a new theory. Nevertheless, Richard Lindzen (E&E, 2007) has already offered an alternative theory that better matches the observations. He too is subject to the Popperian rule, but as yet (SFAIK) no observations have been produced to refute his (amended) version of AGW re measured versus predicted climate sensitivity. Your Q#3: “If and when a medical doctor, or a group of doctors, diagnose a dangerous epidemic, or a life-threatening illness, how much time and effort should one spend in attempting to look at real or imaginary faults in the diagnosis?” A#3: as long as it takes, e.g. that nasty equine virus in Queensland which has more capacity to wipe us all out than AGW if the diagnosis is wrongly determined and resolved. Your Q#4 “Risk assessment: People issue insurance to the value of $thousands each year, and nations spend $billions (the $US trillions) on defence based on risk assessments. Climate change is a risk established by the World’s major science institutions (Hadley, NASA, Potsdam, CSIRO, BOM) …” The latter part of this Q. is no more than an appeal to authority. I know that if I cited the Pope as an alternative Authority you would not accept him – and neither do I. How much do you spend on insurance (on house car and life)? In my case not more than one percent of my income. Whatever Garnaut may claim, his ETS involves huge cuts in my income – even the softer Green Paper indicated four times what I spend on insurance just on my higher energy bills, and the Sims Report to the Aus. Business Council confirms this, as also the Leak cartoon in yesterday’s The Australian. Barry elsewhere here goes on about rising sea-levels. What evidence is there for rising home insurance premiums at Rose Bay etc in Sydney? As for Defence, there is no accounting for stupidity, for all its billions the US cannot even save Georgia. Your Q#5. “If all these scientists are incorrect, the damage in the error would pale into insignificance compared to the damage caused if the denialists are wrong”. I am not a denialist, only sceptical about most religion including AGW. I have so far incurred no personal costs from all AGW observable since c1976, and I expect none before I shuffle on. My personal plan is to squirrel as much as I can, subject to the Garnaut-Wong depredations on my income, for my heirs and successors. The richer they are by say 2050, with my help via their inheritance, the better placed they will be to adapt to whatever AGW may have in store for them. Finally, Andrew said Q#6: “Is there any stage, in terms of temperature rise, ice melt rates, sea level rise, slowing-down of the Gulf stream, or storm intensity, where the denialists would concede GW is actually taking place?” The temperature rise is not evident in the satellite graph displayed in Jennifer Marohasy’s article in The Australian yesterday, despite the upward trend in CO2. 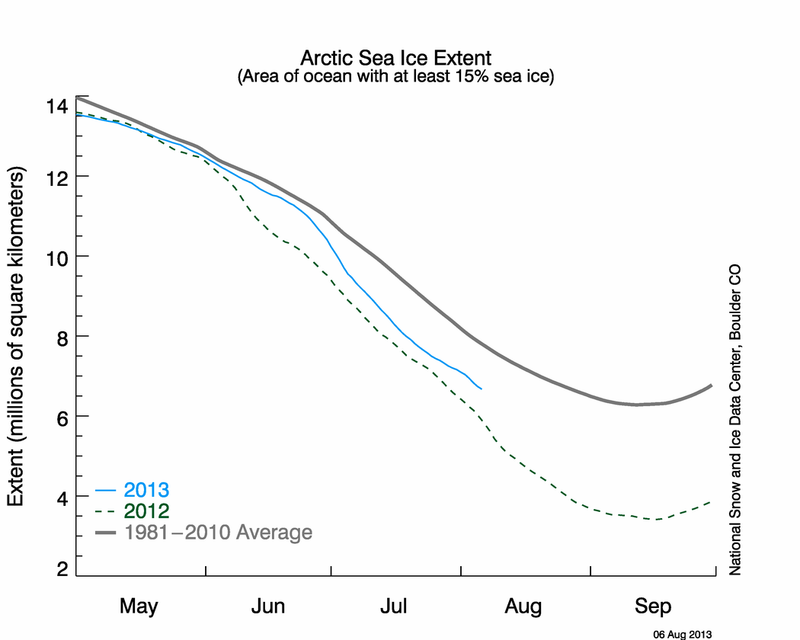 The ice melt series may well be more cyclical than secular. What is your source for the slowing Gulf Stream? There is no evidence I am aware of for increasing global storm intensity, if there is, where? Dear Andrew, get a life, relax, fire up the barbecue, and think what its CO2 will do to boost the yields at your vegie garden! It’s a good way of avoiding explaining just when it was that NASA allegedly “backed off”, or why you use temperature data from continental USA and pretend they represent the whole world when continental USA is only 1.6 per cent of the world’s surface,but then complain global temperature series are no good because, for a time, Africa was not very well covered. etc etc. On the other hand, feel free to call yourself “Mr X” and I’ll still call you out when you’re fudging. It’s the arguments that matter. In general terms: I am still searching for evidence which may contradict the serious nature of directly-observed climate trends, and would encourage anyone who has such evidence to submit it for publication in the scientific literature. That actual temeprature rise rates, ice melt rates and climate zone migration rates exceed IPCC observations, as reported by principal climate scientists (Rahmstorf, Science Express, 200 – which I append below this message) is of major concern, showing that if the IPCC reports were in error, the error was in underestimating the pace of climate change. Unless of course some people consider that the IPCC, CSIRO, NASA, Hadley, Potsdam and thousands of scientists, who publish through the peer review system, are involved in some kind of a conspiracy …? As of course you are aware the scientific method is based on the painful long term process of gathering data, developing interpretations consistent with established physics and chemistry, proceeding through rigorous peer review. I know of no alternative to this method. Accepting your sincere wish to identify the reality of climate change, I will be happy to send you a pdf reprint of my recent paper “Milestones in the evolution of the atmosphere with reference to climate change” published in the Australian Journal of Earth Science (if so, let me know which E-mail address to send it to). In this case, we can discuss the observations in further detail. of 3 ºC for a doubling of CO2 concentration, while the grey band surrounding the scenarios shows the effect of uncertainty in climate sensitivity spanning a range of 1.7 – 4.2 ºC. preceding 115 years. Again, we caution that the time interval of overlap is short, so that internal decadal climate variability could cause much of the discrepancy; it would be premature to conclude that sea level will continue to follow this “upper limit” line in future. The largest contributions to the rapid rise come from ocean thermal expansion (4) and the melting from non-polar glaciers as a result of the warming mentioned above. While the ice sheet contribution has been small, observations are indicating that it is rapidly increasing, with contributions both from Greenland and Antarctica (e.g., ref. 5). Overall, these observational data underscore the concerns about global climate change. Previous projections, as summarized by IPCC, have not exaggerated but may in some respects even have underestimated the change, in particular for sea level. 1. IPCC. Climate Change 2001 (Cambridge University Press, Cambridge, 2001). 2. Church, J. A., and N. J. White, Geophys. Res. Lett., 33, L01602, doi:10.1029/2005GL024826 (2006). 3. Cazenave, A. and R. S. Nerem, Rev. Geophys., 42, 20 (2004). 4. Willis, J. K., D. Roemmich, and B. Cornuelle, J. Geophys. Res., 109, C12036, doi:10.1029/2003JC002260 (2004). 5. A. Cazenave, Science 314, 1250 (2006). 6. Moore, J. C., Grinsted, A. & Jevrejeva, S., Eos 86, 226 (2005). Thanks Andrew for your comments. You said ”I am still searching for evidence which may contradict the serious [sic] nature of directly-observed climate trends, and would encourage anyone who has such evidence to submit it for publication in the scientific literature”. Recall that Canadell et al. were main authors of Chapter 7 of WG1, in the AR4, and that Canadell et al (2007) was published in the peer reviewed PNAS. So much for peer review! Yet you and Barry et al here still have this touching faith in peer review. No doubt you will demand that I submit my Comments on Canadell et al to PNAS, but why don’t you do it for me, or jointly with me? Unlike you I have no paid academic affiliation, and also lack the 7 academically-affiliated co-authors that appear to be the minimum to secure consideration by PNAS. Meantime Team Garnaut if it continues to cite Canadell will be guilty of unconscionable behaviour. For it is the misleading data in Canadell et al 2007 claiming that the biospheric sinks are already saturated (as they sure would be if their projections were valid!) which underpins all the projections in Ch. 4 and 5 of the Garnaut Draft Report. I have already twice formally pointed out the Canadell errors to the G Report team, so they are not unaware. BTW, the G Report was not peer reviewed. How much of the alarm that you, Andrew, feel, is due to the questionable data handling by such key IPCC authors as Canadell et al? Two of Canadell et al (Houghton, Ciais) had previously published data on land use emissions which are seriously at variance (as much as 30% higher) with what appears in Canadell et al, but they had no hesitation appending their names. Yes please, I would like your EarthSciences paper, will email you asap. Dear Andrew, get a life, relax, fire up the barbecue, and think what its CO2 will do to boost the yields at your vegie garden!. Once again (ad infinitum, it seems), Tim Curtin demonstrates his refusal to accept that human addition of a greenhouse gas to the atmosphere will increase its overall temperature, whilst blithely accepting that the addition of a largely non-limiting substrate for photosynthesis will increase plant growth, in complete ignorance of the negative impacts of the same said increase in this subtrate. As has always been the case, Tim’s understanding of photosynthesis, and more generally of trophic ecology, is confused at the very least. posted 25 August 2008 at 10:18 PM by Bernard J. Will global warming cause a mass extinction event?